This gorgeous, newly-renovated 4-bedroomed house, located in the heart of Riebeek Kasteel, can accommodate up to 8 people. The house is a mere stone’s throw from popular restaurants, pubs, shops and the renowned wine and olive boutiques of this unspoilt and charming village. The accommodation at Suikerbossie is luxurious and has been designed with your every comfort in mind. Quirky Cape decorator, Salomé Gunter, was given carte blanche to design Suikerbossie’s beautiful interior and she did it with her usual style. In winter you’ll remain cosy and snug, as each en-suite bathroom has underfloor heating. The central fireplace in the lounge keeps the whole house warm and toasty. Suikerbossie boasts a fully-equipped, modern kitchen, including a gorgeous lime green Smeg fridge, stainless steel kitchen surfaces, and with all the necessary crockery, cutlery, pots, pans and utensils for self-catering. The comfortable sitting room with a colonial paddle fan and dining room with a lovely traditional dining table are open plan to the kitchen and create the ideal environment for total relaxation. Another fabulous chill-out area, with a wooden dining table and seating for 8 people, is situated under the cool pergola near the pool. 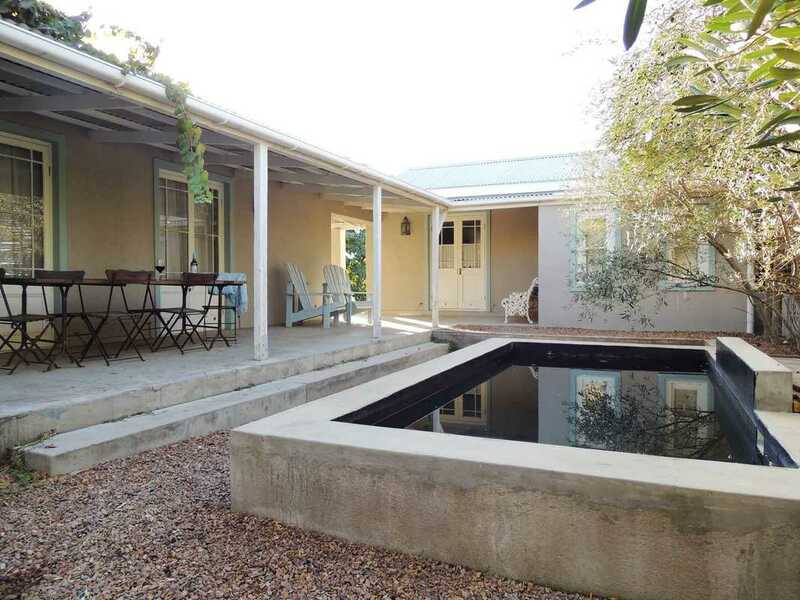 The wrap-around farm stoep is reminiscent of the 1920s and is the perfect spot to watch village life go by. With its built-in bench with comfy cushions, chairs and table, the stoep is ideal for al fresco meals and, of course, South Africa’s favourite entertainment, a traditional braai. Should you require different check-in / check-out times, please discuss this upon booking.